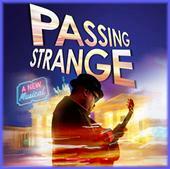 I made my Broadway debut onstage this weekend in Passing Strange. This is a first for me – costumes, props, spoken lines, acting. It’s fabulous fun, and icing on the cake after the intense rehearsal and prep period. The show is getting great reviews & looks to be in the running for several Tonys. Kathie Edmonds took my score and generated the most beautiful parts I’ve ever seen. Meanwhile we continue to rehearse understudies & subs and prepare for the awards season. If you’re in town, come see our Rock Show at the Belasco! March 2008. Tags: performance, theater.